I received a box of Feosol Iron Supplements to facilitate this post. The opinions below are my own. My freshman year of college I got really run down. I started feeling weak and exhausted all the time. I went to the "quack shack" - aka the university medical center, and they tested me for mono. But it was negative. One day I was trudging up the three flights of stairs to my French class when I was hit by such strong dizziness and weakness that I had to sit down. In the middle of the flight of stairs. Let me tell you - I still remember how gross that floor was as I stared down at it, wondering how I would ever make it up to my class. It turned out that I had an iron deficiency. Not fun! 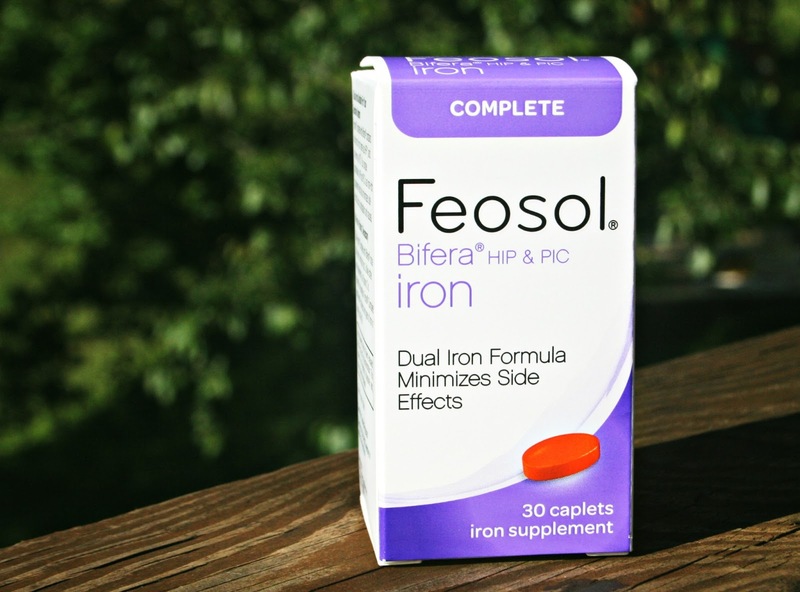 Feosol Iron with Bifera is an iron supplement that minimizes side effects. Because if you've ever taken iron, you know it can be really rough on the stomach. It is a heme based iron, so it actually increases absorption while decreasing nausea and constipation. Fatigue is so common in women, and many of us ignore the symptoms and just keep pushing on. I know I am guilty of this. It never hurts to check in with your doctor about these things. And long before you're stuck in a dirty stairwell with no clue of how to get up! Want to win some Feosol iron supplements? Click on the Rafflecopter below. Remember to always check with your doctor before starting an iron supplement. Very interesting post. I'm glad you found the problem and a solution! I've always had very pale skin and even in childhood my grandmother would always tell my mom that I was iron deficient. I was not. I was just pale. LOL Grandmothers... gotta love 'em. I'm waiting for my test results to see if I'm iron deficient. Hope I'm not. My mother has struggled off and on with iron deficiency for years. It can creep up on you slowly but surely, she found. I don't eat meat so I have to be careful about keeping my iron up too. Happy to see this post. My iron levels have been low at times --and I've had to take iron pills. BUT--somehow, they do not LIKE me... I get extremely constipated when I take them --so these days, I avoid them. Luckily, my iron levels are fine right now. I had to take iron supplements when I was younger. It got so bad that I was really short of breath. This would really be worth checking out! John takes a slow release Iron. Its great to find stuff that really works! I had iron deficiency when I was in my 20's but that was long ago! Some people get too much iron ... I forget the name for that but it does happen. No doubt, a post that will bring reassurance and relief to many who can relate, Lisa! I am anemic so I take iron everyday. Also love Vitamin D! Thank you for sharing. My iron drops so low it almost doesn't register on the reicter level ! Take tablets twice a day now!! I just take vitamin B Complex. The brand varies. my favorite supplement to take is iron and calcium. thanks for the givaway :)! I'd have to say Vitamin C.
I currently take (or am supposed to take) a prescription iron supplement & vitamin D supplement. I would like to try the B complex vitamins. I am taking Sunncelle and I really like it. Also fish oil.